There is no such thing as "international terrorism". To declare war on "international terrorism" is nonsense. Politicians who do so are either fools or cynics, and probably both. Terrorism is a weapon. Like cannon. We would laugh at somebody who declares war on "international artillery". A cannon belongs to an army, and serves the aims of that army. The cannon of one side fire against the cannon of the other. Terrorism is a method of operation. It is often used by oppressed peoples, including the French Resistance to the Nazis in WW II. We would laugh at anyone who declared war on “international resistance”. Carl von Clausewitz, the Prussian military thinker, famously said that "war is the continuation of politics by other means". If he had lived with us today, he might have said: "Terrorism is a continuation of policy by other means." Terrorism means, literally, to frighten the victims into surrendering to the will of the terrorist. Terrorism is a weapon. Generally it is the weapon of the weak. Of those who have no atom bombs, like the ones which were dropped on Hiroshima and Nagasaki, which terrorized the Japanese into surrender. Or the aircraft which destroyed Dresden in the (vain) attempt to frighten the Germans into giving up. Since most of the groups and countries using terrorism have different aims, often contradicting each other, there is nothing "international" about it. Each terrorist campaign has a character of its own. Not to mention the fact that nobody considers himself (or herself) a terrorist, but rather a fighter for God, Freedom or Whatever. MANY ORDINARY Israelis felt deep satisfaction after the Paris events. "Now those bloody Europeans feel for once what we feel all the time!" Binyamin Netanyahu, a diminutive thinker but a brilliant salesman, has hit on the idea of inventing a direct link between jihadist terrorism in Europe and Palestinian terrorism in Israel and the occupied territories. This has nothing to do with reality. Palestinians who want to fight and die for Allah go to Syria. Palestinians – both religious and secular – who shoot, knife or run over Israeli soldiers and civilians these days want freedom from the occupation and a state of their own. This is such an obvious fact that even a person with the limited IQ of our present cabinet ministers could grasp it. But if they did, they would have to face very unpleasant choices concerning the Israeli-Palestinian conflict. So let's stick to the comfortable conclusion: they kill us because they are born terrorists, because they want to meet the promised 72 virgins in paradise, because they are anti-Semites. So, as Netanyahu happily forecasts, we shall "live forever by our sword". TRAGIC AS the results of each terrorist event may be, there is something absurd about the European reaction to recent events. The height of absurdiocy was reached in Brussels, when a lone terrorist on the run paralyzed an entire capital city for days without a single shot being fired. It was the ultimate success of terrorism in the most literal sense: using fear as a weapon. But the reaction in Paris was not much better. The number of victims of the atrocity was large, but similar to the number killed on the roads in France every couple of weeks. It was certainly far smaller than the number of victims of one hour of World War II. But rational thought does not count. Terrorism works on the perception of the victims. It seems incredible that ten mediocre individuals, with a few primitive weapons, could cause world-wide panic. But it is a fact. Bolstered by the mass media, which thrive on such events, local terrorist acts turn themselves nowadays into world-wide threats. The modern media, by their very nature, are the terrorist's best friend. Terror could not flourish without them. The next best friend of the terrorist is the politician. It is almost impossible for a politician to resist the temptation to ride on the wave of panic. Panic creates "national unity", the dream of every ruler. Panic creates the longing for a "strong leader". This is a basic human instinct. Francois Hollande is a typical example. A mediocre yet shrewd politician, he seized the opportunity to pose as a leader. "C'est la guerre!" he declared, and whipped up a national frenzy. Of course this is no "guerre". Not World War III. Just a terrorist attack by a hidden enemy. Indeed, one of the facts disclosed by these events is the incredible foolishness of the political leaders all around. They do not understand the challenge. They react to imagined threats and ignore the real ones. They do not know what to do. So they do what comes naturally: make speeches, convene meetings and bomb somebody (no matter who and what for). Not understanding the malady, their remedy is worse than the disease itself. Bombing causes destruction, destruction creates new enemies who thirst for revenge. It is a direct collaboration with the terrorists. It was a sad spectacle to see all these world leaders, the commanders of powerful nations, running around like mice in a maze, meeting, speechifying, uttering nonsensical statements, totally unable to deal with the crisis. THE PROBLEM is indeed far more complicated than simple minds would believe, because of an unusual fact: the enemy this time is not a nation, not a state, not even a real territory, but an undefined entity: an idea, a state of mind, a movement that does have a territorial base of sorts but is not a real state. This is not a completely unprecedented phenomenon: more than a hundred years ago, the anarchist movement committed terrorist acts all over the place without having a territorial base at all. And 900 years ago a religious sect without a country, the Assassins (a corruption of the Arabic word for "hashish users"), terrorized the Muslim world. I don't know how to fight the Islamic State (or rather Non-State) effectively. I strongly believe that nobody knows. Certainly not the nincompoops who man (and woman) the various governments. I am not sure that even a territorial invasion would destroy this phenomenon. But even such an invasion seems unlikely. The Coalition of the Unwilling put together by the US seems disinclined to put "boots on the ground". The only forces who could try – the Iranians and the Syrian government army – are hated by the US and its local allies. Indeed, if one is looking for an example of total disorientation, bordering on lunacy, it is the inability of the US and the European powers to choose between the Assad-Iran-Russia axis and the IS-Saudi-Sunni camp. Add the Turkish-Kurdish problem, the Russian-Turkish animosity and the Israeli-Palestinian conflict, and the picture is still far from complete. It has been said that war is far too important to leave to the generals. The present situation is far too complicated to leave to the politicians. But who else is there? ISRAELIS BELIEVE (as usual) that we can teach the world. We know terrorism. We know what to do. For weeks now, Israelis have lived in a panic. For lack of a better name, it is called "the wave of terror". Every day now, two, three, four youngsters, including 13-year old children, attack Israelis with knives or run them over with cars, and are generally shot dead on the spot. Our renowned army tries everything, including draconian reprisals against the families and collective punishment of villages, without avail. These are individual acts, often quite spontaneous, and therefore it is well-nigh impossible to prevent them. It is not a military problem. The problem is political, psychological. Netanyahu tries to ride this wave like Hollande and company. He cites the Holocaust (likening a 16-year old boy from Hebron to a hardened SS officer at Auschwitz) and talks endlessly about anti-Semitism. All in order to obliterate one glaring fact: the occupation with its daily, indeed hourly and minutely, chicanery of the Palestinian population. Some government ministers don't even hide anymore that the aim is to annex the West Bank and eventually drive out the Palestinian people from their homeland. There is no direct connection between IS terrorism around the world and the Palestinian national struggle for statehood. But if they are not solved, in the end the problems will merge – and a far more powerful IS will unite the Muslim world, as Saladin once did, to confront us, the new Crusaders. Attached herewith is Presidential candidate Marco Rubio’s “peace thru strength” plan for “restoring” America’s defense. To be sure, this is only an opening shot in a Presidential bidding war that is sure to intensify in the coming months, with each candidate in every party trying to out-tough the others by spending more on defense (Bernie Sanders and Rand Paul perhaps being the only exceptions). Before reading Rubio's piece of strategic wisdom, I urge you to think about the magnitude of what Rubio calls "$1 trillion in indiscriminate defense budget cuts.” Rubio’s $1 trillion total is for cutbacks in the Pentagon’s future projections of its defense spending plans, not the actual cutbacks from the spending peak in 2010. 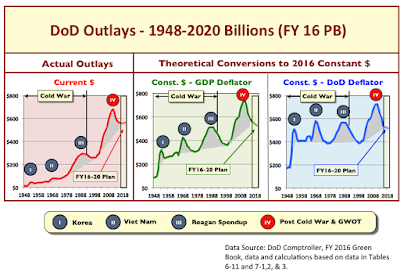 The graphic below places the actual cutbacks into a historical perspective: The chart shows that DoD spending declined by between $110 and $154 billion between 2010 and 2015, depending on if or how one chooses to account for inflation. One can compare the reductions from the most recent boom's peak in 2010 (labeled #IV in the graphic) to those reductions after earlier peaks (#s I, II, & III). The effects of the $110 to $154 billion in cutbacks since 2010 are now embodied in Mr. Obama spending plan for 2016-2020 (highlighted in the yellow rectangle on the far right of each graph). These cutbacks do not come close to accounting for the Pentagon's bow wave* of financial requirements in the laundry list outlined by Rubio in his attached “policy” statement. The chart shows there is a boom-bust character to defense spending. The recent inflection point suggests we are approaching the end of the fourth bust and may be on the cusp of another or fifth boom. 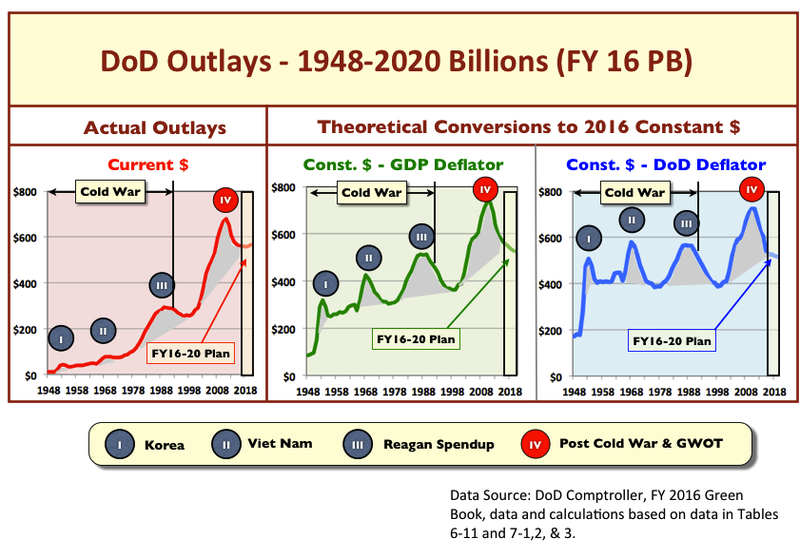 Comparatively speaking, the current inflection in DoD’s spending shows signs of bottoming out at a much higher level than for any of the three preceding busts, all of which were conditioned by the Cold War. Even the prominent spending hawk Loren Thompson recently characterized the current bust as being the “mildest defense downturn on record." Note that Thompson's characterization of the most recent downturn as being relatively mild remains unchanged, regardless of how one accounts for the effects of inflation. This is true even if one uses DoD’s self-serving estimates of inflation which make the earlier budgets of the 1950s and 1960s look larger — thereby making the current budget look like less of a departure from past budgets. Yet Mr. Rubio wants us to believe the most recent cutbacks have been catastrophic in their effect. So, one might reasonably ask Mr. Rubio the following question: After spending all that money during the boom between 1997 and 2010, which was by far the largest spending spree since the end of WWII, and given the relative mildness of the recent declines, why do you say it is now necessary to embark on an even larger crash program to rebuild our defenses? Could it be that the pissant war on terror has cost far more than either of the far more intense wars in Korea or Vietnam (intensity being measured in terms of optempos and forces deployed)? And if so, would you please explain why the the Global War on Terror costs so much more than Vietnam or Korea, or for that matter even World War I? And can you explain why the diversion of money into GWOT resulted in a requirement for the kind of massive investment program you describe below? In short, Mr. Rubio, where did the money spent in boom #IV go? And how can you account for it, given that the Pentagon’s own bookkeeping system can not pass an audit that links transactions to appropriations as required by the Chief Financial Officers Act of 1990 and the Accountability and Appropriations Clauses of the Constitution? Such common sense questions, of course, will not be asked in any of the circuses passing for presidential debates, or by pliant reporters in the mainstream media, or by poohbahs on the Sunday talk shows. But if you want to get a hint of what these record budgets bought for the taxpayers, before the budget started declining in 2010, I would urge you to reread the blaster, Flush With Cash, Running on Empty (I), posted last June. Since no one will ask Rubio these questions, ask yourself, dear reader, “What kind of security will Rubio's plan really buy for John Q. Average American?" Hint: Could the answer be more of the same, that is to say: (1) continued aging of weapons, (2) more shrinking of force structures, (3) increased pressure to cut readiness to bail out the imploding modernization program, and most importantly, (4) a continuation of ever intensifying budget crises fueled by cost growth to be exploited by demagogic ignoramuses who are in the hip pocket of the Military - Industrial - Congressional Complex? * The term “bow wave” refers to a buildup of budget requirements in the future that is created by investment decisions made today. It is a chronic feature of defense planning and is created deliberately by the bureaucratic gaming strategies explained in Part III of my 1990 pamphlet Defense Power Games. The bow wave of rising investment requirements sets up the conditions for a continual budget crisis that creates increasing pressure to raise defense spending over the long term. These pressures have nothing to do with any external threats facing the United States but go a long way in explaining the boom and bust pattern of defense spending..
Work to return to Secretary Gates’ fiscal year 2012 budget baseline over the course of his first term and begin to undo the damage caused by $1 trillion in indiscriminate defense cuts. Plug critical operations and maintenance shortfalls, restore military readiness through accelerated training and exercises, and make targeted investments in urgent modernization priorities. Work with our allies in Asia to forward deploy a second aircraft carrier in the Pacific while increasing the carrier force from 10 to 12. Restore continuous, credible naval combat power to the Mediterranean Sea. Build the new Ohio-class Replacement (ORP) ballistic submarine to ensure a credible and survivable 21st century strategic deterrent. Fully integrate the F-35B and push ahead with development of a new amphibious-assault vehicle. Build an amphibious fleet of 38 ships (from today’s 30) to meet the Marine Corps wartime lift requirement. Reverse reductions to the operating status of 11 of our 22 current cruisers. Replenish depleted inventories of critical munitions while accelerating development and procurement of new advanced strike and anti-ship missiles. Fully fund Navy-Marine Corps maintenance and modernization accounts. Invest in better Intelligence, Surveillance, and Reconnaissance capabilities at the theater and strategic levels. Prioritize returning Air Force readiness to pre-Obama levels. Ensure that the KC-46 tanker program stays on track to replace the aging KC-135 fleet. Ensure development of the Long-Range Stand-Off weapon. Strengthen international partnerships to reduce the need to deploy ground troops. Work to return a corps headquarters to Europe and station additional BCTs in Eastern Europe to deter Russian aggression. Reexamine the Army’s mobility and prepositioning to respond to crises in the Pacific. Continue to invest in Army Special Operations capabilities to remain at the cutting edge of the continuing war on terrorism. Revamp the Army’s acquisition system and specifically look at options to modernize its aging vehicle and helicopter fleets. Reform the military benefit structure and military career paths and specializations to attract and retain high quality personnel to the military, while preserving a sustainable balance between training and procurement needs. Continue recent efforts to reform military retirement, education, and healthcare on the basis of the recommendations of the Military Compensation and Retirement Modernization Commission. Ensure the Department of Veterans Affairs is accountable and that our veterans have access to the best treatment possible when they return from the battlefield. Optimize the Pentagon workforce by shrinking the Pentagon bureaucracy and achieving the correct balance between uniformed personnel, civilians, and contractors. Facilitate a more-technologically agile and adaptable workforce that can leverage technological evolution. Develop fellowship programs in the private sector for defense department personnel to renew skills to comport with industry standards. Streamline the acquisition process to prevent costly mistakes, hold private contractors accountable, and field top of the line technology to future warfighters. Remove barriers and strengthen exemptions for commercial acquisitions allowing the Pentagon to leverage cutting edge commercial technology, such as data analytics, cloud computing, 3-D printing, and robotics. Work interoperably with allies on missile defense — we should encourage the spread of missile defense technology as a solution to the spread of ballistic and cruise missiles. Ensure continued freedom of access to space in the face of a potential adversary’s development of anti-satellite missiles. Pursue arms control only when it is in America’s interest and when prospective negotiating partners comply with their commitments to us. Ensure U.S. military technological superiority by prioritizing key areas of defense technology that will counter those adversaries and competitors seeking to undermine our military predominance. Expand the use of rapid acquisition processes for key innovative technologies. Improve cyber defense capabilities by hardening DoD systems and examining the sourcing of our weapons components. Outline a declaratory policy so our adversaries understand the consequences of attacking our computer systems. Improve offensive cyber capabilities and ensure that Cyber Command cyber mission forces have the tools and authorities to perform the cyber offensive mission. Better integrate cyber threats and cyber aspects of modern warfare in training, doctrine, and exercises across the combatant commands. Ensure that the cyber threat is appropriately prioritized by all services; study whether cyber should be its own service rather than a mission of the Army, Navy, Marines, and Air Force. The blog and the CAP itself are quite useless for people trying to understand the real issues at stake for what remains of the old Democratic coalition put together by FDR and how the Democrats placed themselves on a pathway to their own self-destruction by evolving neoliberal responses in the 1980s (like the Democratic Leadership Council) to the wedge issues first exploited by Richard Nixon. That is because the CAP is really a political front for the progressive apparatchiks in the emerging Clinton neoliberal oligarchy. The CAP’s founder John Podesta, a long time Clinton aide, is managing Hillary Clinton’s campaign for president. The current CAP president, Neera Tanden, is a long time Clinton confidant and advisor. The independent investigative journalist Glenn Greenwald just exposed (attached below) the mentality of the people who are running the CAP. That mentality is made evident by their own words, expressed in emails leaked by someone inside of the CAP to Greenwald. The emails describe the CAP’s obsequious pandering to Israeli Prime Minister Netanyahu and AIPAC. This is to be expected, of course; and the pandering is the primary focus of Greenwald’s report. That said, the cynical distancing of CAP and Ms. Clinton from a sitting Democratic President is worse than even the most jaded readers of the Blaster might expect. There you have it: A “liberal progressive's" mutation of guns and butter politics for the 21st Century! 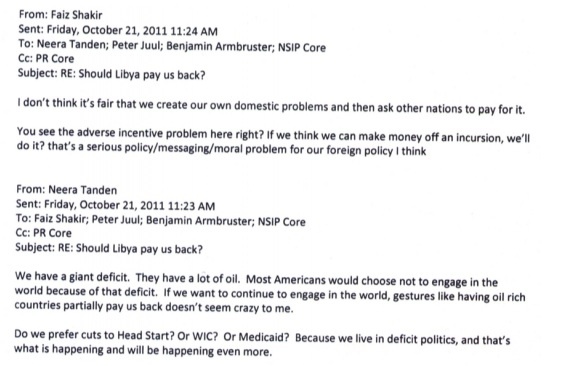 Ms. Tanden thinks we should make the countries we bomb use their oil wealth to reimburse us for the cost of bombing them. That way we don’t have to cut Head Start, food stamps, or Medicaid. This is an insensitive policy wonk’s version for what we in the Pentagon used to call a “self licking ice cream cone.” It is necessary, Ms. Tanden asserts, because we live in an era of intensifying "deficit politics.” This is a brand of politics that neoliberal Democrats brought upon themselves by going along with Reagan tax cutting and defense spending policies, increasing privatization since the days of Jimmy Carter, and Mad King George’s pre-9-11 reckless tax cuts and defense increases in 2001*. But there is more to Tanden's vision. Consider, please, the possibilities inherent in its elegant symmetry: Using war to fund social programs effectively synthesizes (1) the neoconservative impulse to wage war on everyone with, (2) the tenets of neoliberalism, and (3) what remains of the US welfare state. Like Bill Clinton’s theft of the NATO expansion issue from Bob Dole in October 1996 during the last month of the presidential election, Tanden’s vision pulls the rug out from under the warmongering nutcases on the right, while placating both the money lust of the Military - Industrial - Congressional Complex and the humanitarian interventionists on the “left," but it also panders to what's left of the old time social liberals who have been dealt out of the game since the days of LBJ. That is how “think progress” relates to the moral, mental, and material progress in the Hall of Mirrors. * Readers would be wrong to think that the Pentagon’s huge budget increases were triggered entirely by 9-11. As this paper shows on pages 2-3, most of the increases were already planned and in the Pentagon’s computers by the end of July, 2001, well before 9-11. To be sure, the Pentagon and the Bush Administration exploited the hysteria triggered by 9-11 to ratchet the budget beyond this projection of the Global War on Terror’s initial cost estimates projected in the figure. Glenn Greenwald, The Intercept, Nov. 5 2015, 2:04 p.m.